Ruth Negga, Joel Edgerton as Mildred and Richard Loving. Viewing a movie such as LOVING you almost get the feeling that the film and the circumstances that spawned its story are from some medieval time centuries ago. Then you consider the events that unfolded in 2016 related to minorities and the mainstreaming of white supremacy, and the realization hits that those circumstances might be closer than ever. Miscegenation ruled the South along with a myriad of other bigoted laws at the time that were meant to maintain white supremacy. But many people could see past that thinly veiled racism to get to the heart of the matter. 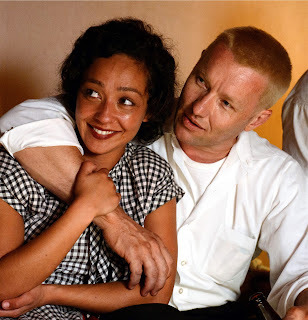 Such were the Lovings, Richard (Joel Edgerton) and Mildred (Ruth Negga), an interracial couple (he white, she black) who committed the crime of falling in love and marrying in 1958. In their small, Virginia county that was verboten. No race mixing, let alone interracial marriage. Despite “knowing better,” according to the local sheriff and even his mother, Richard (an almost unrecognizable Edgerton) asks Mildred to marry him because he loves her and because she’s pregnant. Of course they can’t do so in Virginia. Instead, they head to Washington D.C. where it’s legal. After their wedding, they’re eventually arrested, forced to leave the state and live miserably in the nation’s capital. By the time they’ve suffered through enough indignity, the Civil Rights movement is gaining steam. A letter to Attorney General Bobby Kennedy results in aid coming from the American Civil Liberties Union and the Lovings’ battle begins. The beauty in the film comes from its simplicity. Wisely director-writer Jeff Nichols allows everything related to film to flow from that concept. It’s a question that members of minority groups and people who are actually free from bigotry have asked themselves at one point or another in their lives. In that regard, Loving is entirely relevant in today’s America where we’ve seemingly taken steps backward. But even if that weren’t the case, LOVING would still be an impressive film because Nichols chooses to do things without the dramatic grandeur that curses many a film with noble intentions. He allows the story to essentially tell itself through Richard and Mildred. In that regard, we see something in Edgerton entirely new. He buries everything regarding his Australian heritage to transform himself into a country boy. Richard possesses a simplistic view on life, but he’s not naïve. Negga conveys Mildred’s forceful innocence in a similar manner. The performances aren’t adorned with bells and whistles, but they possess sincerity and authenticity. It would be easy to call LOVING a “beautiful” film, but at this moment in time it’s a call to not forget the past lest we are doomed to repeat its mistakes.